Gamma amino butyric acid with vitamin B, called GABA for short, is a powerful non-essential amino acid that has great benefits for your brain. GABA is often referred to as the brain's natural calming agent, and is what helps alleviate anxiety, tension and nervousness. The B vitamins also have excellent relaxing properties. Combined, these two supplements can do an incredible job at naturally alleviating stress and anxiety. GABA was discovered over 50 years ago, and since then scientists have found it to be highly effective at providing a sense of relaxation. According to WebMD, research has shown GABA may have a calming effect on the central nervous system, and has been used as a supplement to promote relaxation and improve mood. GABA is an inhibitory neurotransmitter. This means it regulates brain and nerve cell activity by inhibiting or calming the number of neurons firing in the brain. 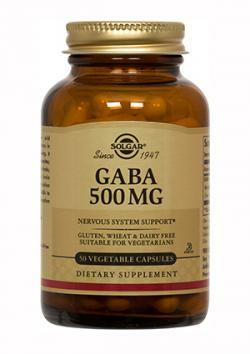 As a result, persons with increased GABA levels report mental and physical feelings of calmness. The B vitamins also promote feelings of relaxation and prevent memory loss. A study published in the October, 2011 edition of Human Psychopharmacology showed that participants taking a high dose vitamin B complex for three months reported less work-related stress and reduced confusion than participants that did not take vitamin B complex. Taken together as one supplement, gamma amino butyric acid with vitamin B is likely to help alleviate symptoms of anxiety. GABA and vitamin B may also contribute to improved brain function and health. Children can suffer from GABA deficiencies as frequently as adults do. When deficient, children tend to feel the same anxiety and restlessness as adults. In children, this anxiety and restlessness often presents as Attention Deficit Disorder (ADD). According to the September, 2010 issue of Better Nutrition, several studies have been done that support the use of GABA as an effective treatment of ADHD. According to WebMD, there is currently not enough information to formulate an exact recommended dosage of GABA. Dosage may depend on specific factors such as age, general health, and other conditions. According to WholeHealthMD.com, the recommended daily dosage of GABA when used for stress is 750 mg. per day. If you suffer from anxiety and are considering taking increased dosages of GABA, seek professional guidance from your health care provider. Most doctors are qualified to put you on a GABA dosage plan that will alleviate your anxiety without approaching its toxic threshold. Most Vitamin B complex supplements are packaged for the consumer to take one capsule per day. Vitamin B is a water soluble vitamin and toxicity is rare. Walmart: GABA with Vitamin B-6 and assistive nutrients, approximately $16 for 60 caps-free shipping in continental U.S. It is best to consult with your health care provider before starting any new supplement. You will want to discuss any underlying conditions and all available treatment options. GABA and Vitamin B complex may be a suitable addition to your diet and lifestyle to help support a healthy, productive life.